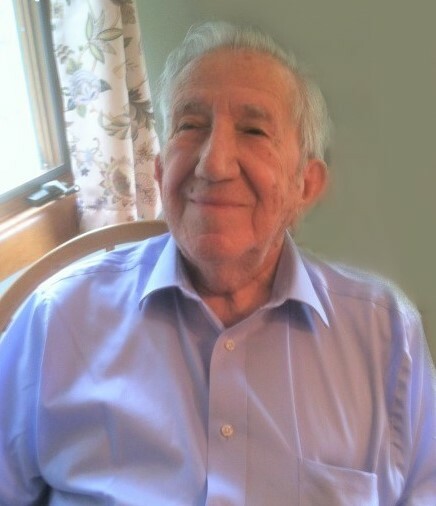 On Tuesday, February 12, Frank J. Cuneo, age 93, passed away peacefully at home with his family by his side. Frank was born in Arlington, MA on December 12, 1925 to Lucy Bertorelli and Frank Cuneo. The family moved to Sharon in 1926 and he lived his entire life there. Upon graduation from Sharon High School, Frank entered the United States Army. He served in World War II as a Military Policeman in Florence, Italy and later spent time working at the Pentagon. In the early 1950s, he began his career as a letter carrier at the Sharon Post Office. His employment there spanned 37 years. On September 8, 1957 Frank married Marie Hurley, also of Sharon. They recently celebrated their 61st anniversary. Frank enjoyed music and he began piano lessons as a young child. He went on to play the accordion, guitar, and organ. He was a good singer and yodeler and entertained his children with both when they were young. Frank also participated in several bowling leagues in his younger years. He was also a skilled woodworker. Many of Frank’s other interests revolved around the natural world. Bird watching, star gazing, and monitoring meteor showers and eclipses were among his favorites. He was also an avid Red Sox and Patriots fan, especially enjoying the World Series win of 2004. Most important to Frank, however, was his family. He spent lots of time taking care of his grandchildren and baking with them. He rarely missed a sporting event or performance that involved his children and grandchildren. He was always on hand to help friends and relatives. Frank is survived by his wife Marie, daughter Jane Kittredge, son John Cuneo and his wife Jill, and daughter Joan Hathaway and her husband Paul. He is also survived by his grandchildren John Kittredge, Nicole Salvo and her husband Robert, Kristen Cuneo, and Elizabeth, Matthew, and Stephanie Hathaway; and great grandsons Dante, Brayden, and Brody Salvo. Frank also leaves behind his brother Joseph Cuneo, his wife Connie and their family, and his cousins Anne Marie Basiliere and Paul Groppi. Frank's passing also leaves a void in the hearts of his sister-in-law and brother-in-law Carol and Bob Simonin and his many nieces, nephews, great nieces, and great nephews on Marie's side of the family. Frank was preceded in death by his parents Frank and Lucy Cuneo, his sister Florence, and his son-in-law Walter Kittredge. Visiting hours will be held on Friday, February 15 from 4 - 8 PM at James H. Delaney & Son Funeral Home, 48 Common Street Walpole, MA. A Funeral Mass will be celebrated on Saturday, February 16, at 10:00 AM at Our Lady of Sorrows Church 59 Cottage Street Sharon, MA. In lieu of flowers, donations can be made to Our Lady of Sorrows Church or to the Sharon Historical Society, P.O. Box 175 Sharon, MA 02067.